In the 21st century, where sexual assault is no longer in the dark and women are at a disadvantage, National Basketball Association team, the L.A. Clippers, signed a deal partnering with Bumble. The L.A. Clippers have the largest female team of executives in the entire NBA, including the president, Gillian Zucker. The dating app Bumble is female-driven, where females on the app get to choose males instead of either gender swiping left or right, like the dating app Tinder. With over 26 million users on Bumble, and the countless viewers of every single Clipper’s game streamed by the NBA, the brand collaboration is a match made in heaven. 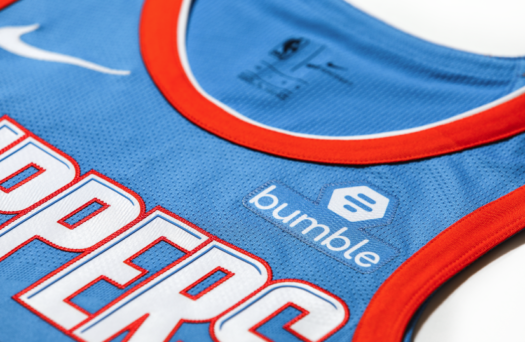 The collaboration is described as “multi-year” by the NBA and will feature the Bumble logo on the Clippers’ jerseys. Others are quite concerned with this as Xhibition worker Jake Damasiewicz states,”I just think they could’ve found another way to promote it than apps that mainly focus on hooking up.” Bumble explains, however, that this use of the logo on Clippers jerseys helps to empower women. The Bumble logo will serve as an “Empowerment Badge” that every Clippers player will wear proudly on the court, representing their support of women in power and encouraging their own female based management team. In addition, Clippers’ community initiatives with children will continue to be strengthened by this partnership. Noting the similarity of each company/team’s core values, this partnership is a first step to recognition and equality of women in the media. “It’s an honor to partner with an organization as progressive and compassionate as the Clippers. Like us, they know generating awareness for diversity and gender equality is critical to business success,” says Bumble Founder and CEO, Whitney Wolfe Herd. The $20 Million deal has made it clear that the need for gender equality is going nowhere anytime soon.